Ussher not only was involved in the creation of articles for the Church of Ireland but effectively gave the Church its creation myth. Growing out of Irish controversies about the status of St. Patrick, Ussher argued (and believed himself) that the Church of Ireland was a return to the original early Christian Irish church, not a departure from it. (For more see McCafferty (1997) and the post Appropriating Patrick.) An extension of Gravissimae Quaestionis, it is still valuable today since many of the original manuscripts Ussher used, particularly the Irish ones, are no longer extant. However Ussher’s Church of Ireland did not survive long, if it ever existed. 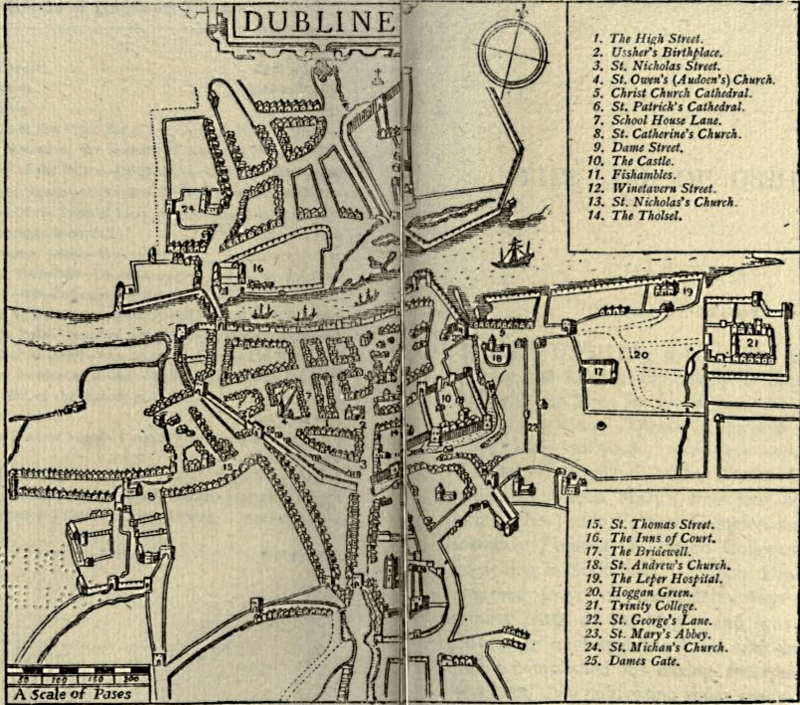 In 1634 the Church of Ireland was forced to adopt the Thirty-Nine Articles and the Irish Articles were suppressed. Though he remained nominally the Primate of Ireland, control of the church passed to Laud, Archbishop of Canterbury (who was so involved that he incensed Richard Boyle, Earl of Cork by moving Boyle’s family monument in St Patricks), Wentworth the Lord Deputy and Bramhall, Bishop of Derry. Perhaps this was inevitable. Gilbert Burnet (historian and friend of Robert Boyle) argued that Ussher “was not made for the governing part of his function. He had too gentle a soul to manage that rough work of reforming abuses”. In the 1630s he chose (or it was chosen for him) that his focus would be scholarship. As well as his works on the early church and his famous or infamous chronology (1650/54/58), Ussher wrote on the question of predestination via a work (1626) on the ninth-century theologian Gottschalk and (1644) demonstrated that several letters attributed to Ignatius of Antioch were not written by him (one of the few scholarly conclusions of Ussher’s that still stands). All these show Ussher’s careful scholarship and his tendency to appeal to the past to answer current controversy. Ussher was in England when rebellion in Ireland broke out in 1641 and never returned to Ireland. In the first year of the Long Parliament, Ussher refused to be involved in the theological debates of the Westminster Assembly, but he did get involved in public campaigns to support the institution of bishops in the established church (episcopacy). He also wrote the posthumously printed Reduction of Episcopacy Unto the Form of Synodical Government (1656), which attempts to forge a compromise government of the church consisting of interlocking synods from parish to province to state, with bishops (possibly renamed superintendents) playing an unspecified role. There is evidence that Ussher later repudiated this scheme in favour of defending full-blooded episcopacy. I was expecting letters from Belgium, from the distinguished Puteanus and our Stanihurst <William, Jesuit and cousin of Ussher>, which have not yet arrived, [but which] will swiftly be brought to satisfy your wishes. At the same time you will see the most welcome [letter] of Colgan, my colleague in [these] studies, and together with those, the letters of Columbanus which you seek. […] The iniquity of time separates us, but your sincere [friend] Brendan will not cease to pray that God’s kindness may join us [again]. […]I beg three things of you, no less vehemently than confidently: that you may fee [back] home from the Pharaonites <the parliamentarians>; that you should spend time, which is now precious, on the better kind of studies to the furthest limit; and that you may bring back a bundle of manuscript codices like spoils from Egypt. Unable or unwilling to follow this advice, Ussher remained in England until he died suddenly on 21st March 1656 in Reigate. His last words were, “O Lord forgive me, especially my sins of omission.” His friends intended to bury him privately in Reigate but Cromwell intervened, and Ussher was buried in St. Erasmus’ Chapel, Westminster Abbey on 17 April, 1656 . John McCafferty (2004) “Ussher, James (1581-1656)” in Thomas Duddy (ed) Dictionary of Irish Philosophers, Bristol: Thoemmes Continuum, pp. 353-356. James Carr (1895) The Life and Times of James Ussher, London: W. Gardner, Darton and co, pp. 8-9. John McCafferty (1997) “St Patrick for the Church of Ireland: James Ussher’s Discourse” in Bullán, Vol 3, No 2. [academia.edu], p. 88. Gilbert Burnet (1685) The life of William Bedell, p. 86, quoted in Ford, 2004. Elizabeth Doran (ed) (2015) The Correspondence of James Ussher 1600-1656, Volume II, pp. 630-632. Doran (2015), Vol III, p. 1095. Doran (2015), Vol III, pp. 859-861. For the complex dividing lines between public and private correspondance for Ussher and his contemporaries, see Doran (2015), Vol I, pp. xlvii-xlviii.